Byron Bay’s unofficial tourist information centre – Gossips Internet Café – has teamed up with Greyhound to provide the resort town with a new coach terminal. Greyhound Terminal Supervisor and former Global Gossip Cafe Manager Katharine Bell says the cafe has been home to the Byron Bay Transit Centre booking desk for more than 11 years. "Global Gossip Cafe has long been the ‘unofficial’ tourist information centre for Byron Bay visitors," she says. "We are in a great spot close to the beach, shops and cafes and there is also a local hostel shuttle service that operates nearby." Bell says travellers, mostly backpackers, can drop in and discuss travel plans or just use the internet. She says the café terminal provides a safe and comfortable wait for coaches, and stays open until the last service leaves Byron Bay each day. Greyhound Australia Chief Executive Officer Robert Thomas says establishing a Byron Bay terminal was good news for the already bustling backpacker town. "The new Greyhound terminal will make sure the thousands of backpackers who travel on our buses each year are well looked after," Thomas says. 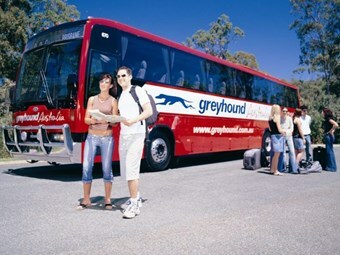 He says Byron Bay is a popular stop on Greyhound’s Sydney to Cairns route. "It makes perfect sense for us to invest in this local community and provide travellers with a better service," Thomas says. "The terminal will also serve Byron Bay residents travelling in and out of the town as well as those who need to send or receive freight and parcels."